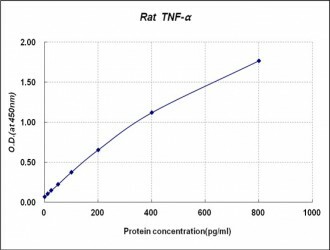 Tumor necrosis factor (TNF)-α is an important cytokine in the innate immune response produced by macrophages, neutrophils, fibroblasts, keratinocytes, NK cells, T and B cells, and tumour cells. TNF-α mediates host responses in acute and chronic inflammatory conditions, and is a mediator of protection from infection and malignancy. TNF-α causes apoptotic cell death, cellular proliferation, differentiation, inflammation, tumorigenesis, and viral replication. TNF-α is initially produced as a biologically active 26 kDa transmembrane protein, which is subsequently cleaved, principally by TNF-α-converting enzyme (TACE), to release the 17kDa free protein. These proteins are arranged in biologically active homotrimers that act on the ubiquitously expressed TNF-α receptors 1 and 2 (TNFR1 and TNFR2). These 17 kDa TNF protomers are composed of two antiparallel β-pleated sheets with antiparallel β-strands, forming a 'jelly roll' β-structure, typical for the TNF family. TNF-R1 is constitutively expressed in most tissues, and can be fully activated by both the membrane-bound and soluble trimeric forms of TNF, while TNF-R2 is only found in cells of the immune system and respond to the membrane-bound form of the TNF homotrimer. Although their extracellular domains share structural and functional homology, their intracellular domains are distinct. 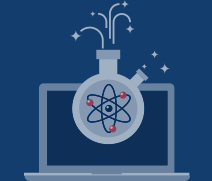 Tumor necrosis factor promotes the inflammatory response, which in turn causes many of the clinical problems associated with autoimmune disorders such as rheumatoid arthritis, ankylosing spondylitis, Crohn's disease, psoriasis and refractory asthma. These disorders are sometimes treated by using TNF inhibitors such as infliximab (Remicade) or adalimumab (Humira).